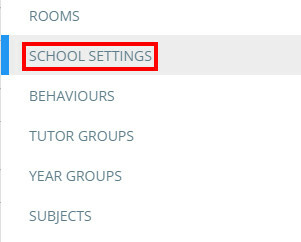 To configure the display settings for you school's Class Charts, start by going to the 'School settings' page from the 3 lines menu in the top right hand corner of Class Charts. From the list on the left hand side of the page select the 'Display' button. - Hide custom fields > only behaviour score is displayed and there is no warning when you try and display more information. - Hide custom fields (with warning)- only behaviour score is displayed but a warning pops up if you try to display more information. Click OK to continue. - Hide custom fields and behaviour scores > both custom fields and behaviour score are hidden and there is no warning when you try and display more information. - Hide custom fields and behaviour scores (with warning) > both custom fields and behaviour score are hidden but a warning pops up if you try to display more information. Click OK to continue. - Disabled > Overall behaviour score is displayed in one points bubble. - Disabled > Classes will not display an icon. - Enabled > Clicking on a pupil card will show that pupil's behaviour activity across all of their classes in the activity feed. - Disabled > Clicking on a pupil card will only show behaviour activity that was recorded in the current class. - Enabled > Clicking on a pupil's photo or silhouette will allow you to choose a pupil avatar from the list of available avatars shown below. - Forced > Pupil avatars will be used for each pupil, regardless of whether they have a photo or not. - Disabled > Avatars will not show up as an option when changing a pupil's photo, and will not appear on the pupil card. - To change desk colour simply click the desk image and choose the colour you want.